There is no question that the Oregon Ducks have become an elite team in college football. At first glance, it would appear that the program has its offensive prowess to thank for its recent success, and this is certainly true to an extent. The Ducks have posted at least 45 points per game in each of the past five years, and quarterback Marcus Mariota brought the school its first Heisman trophy last season. 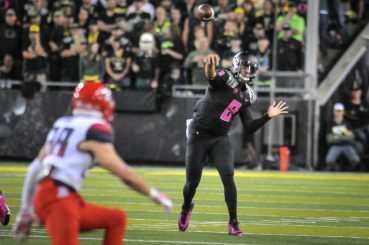 Oregon’s exceptional winning percentage has brought the program into the national spotlight, but perhaps the most impressive aspect of the Ducks recent rise is their display of consistency, which has not been limited to the production of the offense. Oregon’s defense has not reached the same level of elite production that the offense has in recent years, at least not in the conventional sense. However, it has been arguably the most consistent defense in college football over the past several seasons, and does stand out in several important areas. Before diving into the numbers, it is important to first note how consistency will be defined moving forward. The following rankings are based on each team’s standard deviation from their respective statistical averages over the past seven seasons. Due to the large range of numbers in college football, totals can be misleading. Therefore, the consistency rankings below are based on the standard deviation as a percentage of the team’s seven-year average — the lower this percentage, the higher the team’s consistency. When looking at five major defensive stat categories — rushing yards per game allowed, yards per rush allowed, passing yards per game allowed, opponent completion percentage and yards per passing attempt allowed — the Ducks defense proves to be among the most consistent since the start of the 2008 season. Of the 120 teams that have been in the FBS each year during that seven-year span, Oregon is one of only 16 teams to place in the Top-25 in terms of consistency in at least three of those five categories. Consistency does not necessarily translate to success, as teams can be consistently bad, as well as good. It is therefore important to look at Oregon’s production, as well as its reliability. Across all five of these categories, the Ducks had an average rank of fourth among those 16 teams behind only Florida, Virginia Tech and Pittsburgh. This is particularly impressive considering the company that Oregon is keeping here. Florida has been one of the most dominant defensive programs in recent memory, and Virginia Tech has a long, steady history of success under defensive coordinator Bud Foster. While these numbers are certainly impressive, it only gets better for the Oregon defense. This is a squad that thrives on its playmaking abilities more than traditional statistics that are based on totals and yardage allowed. Since 2008, no team has been better than Oregon in terms of taking the ball way from its opponents. Over that span, the Ducks have a total turnover margin of +84, which is the highest total in the nation. To put it into perspective, the second-best margin is +74 recorded by Boise State, and only six teams have even reached the +50 mark in that time. To be sure, the ability of the offense to protect the football has played a large part in this high margin. However, Oregon’s defense is first in total forced fumbles since the beginning of 2008 with 115 and third in total interceptions with 123, proving the key role of the defense. The Ducks have achieved these remarkable totals, at least in part, because of their consistency. 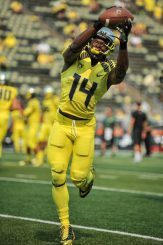 Oregon sits at 15th in terms of forced fumble consistency and 17th in interception consistency over those seven seasons. Conventional wisdom states that turnover statistics will fluctuate from year to year because they are often fluky and can be dependent on the opponent as much as the actual defense. This has not been the case with Oregon. The aforementioned consistency numbers prove this in part, but there are more detailed statistics that drive the point home. Over the past seven seasons, the Ducks have forced 84.3 percent of its opponent’s fumbles, a number good enough to put them fourth nationally in that category. This indicates that Oregon’s high rate of turnovers is no coincidence. The team’s defense is filled with playmakers that fly to the ball and strive to take it away. Take cornerback Ifo Ekpre-Olomu, for example, who forced six fumbles in 2012 alone. On top of its uncanny nose for the ball, the Oregon defense has also been disciplined enough to take away the big play from its opponents on a consistent basis. Of the 259 touchdowns Oregon has allowed since 2008, only 23.55 percent of them have come from outside the red zone. This is by far the lowest total in the nation as Florida sits at second with 27.32 percent. This shows that there is a certain amount of truth to Oregon’s “bend-don’t-break” identity on defense, as the Ducks have displayed the discipline to limit long touchdowns better than anyone in recent history. 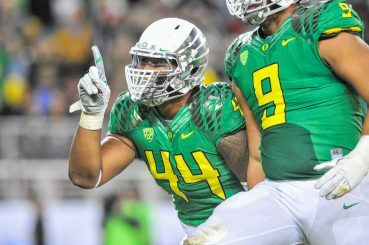 DeForest Buckner will be a leader for Oregon’s defense in 2015. 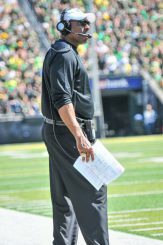 Oregon’s seasoned defensive coaching staff has demonstrated the ability to consistently churn out strong, ball-hawking squads as well as anyone else in college football over the past seven years. The defense has continued to thrive even after the departures of notable stars such as Patrick Chung, Cliff Harris, Dion Jordan, Kiko Alonso and John Boyett. Though the defense loses a few big names this year, most notably Ekpre-Olomu, Erick Dargan and Arik Armstead, Duck fans should be comforted by the program’s consistency in recent years. The Oregon defense will find a way to succeed as it has, even if it does so under the radar, while the Ducks continue to stand among the college football elite.